I unpacked my fall/Thanksgiving decorations this weekend and I realized something...apparently, I am obsessed with pumpkins. With the exception of one little turkey that hangs on the front door, every single fall decoration I have is a variation on a pumpkin. Oops. Perhaps I need to spice it up a little bit, but for now I am embracing it with these teeny pumpkin place card holders! One of the things I love about having married a mechanical engineer is that we have lots of fun things in the garage. 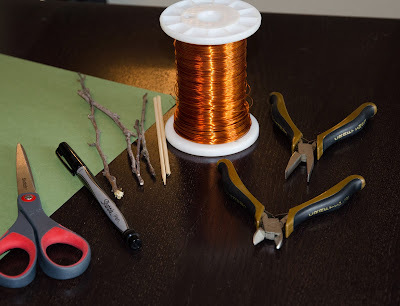 I was headed to the craft store to get some orange/coppery wire and Kevin pulled out a spool of 792 feet of magnet wire - leftovers from making a pulse jet engine. And get this....it wasn't a college project. This was fully a post-college just for fun activity. Haha, I love him so much. Who does stuff like that? Magnet Wire or other easily formable orange wire (Kevin's was 24 gauge) - Magnet wire is the cheapest option I have found so far. Copper wire at craft stores is more expensive. 1. 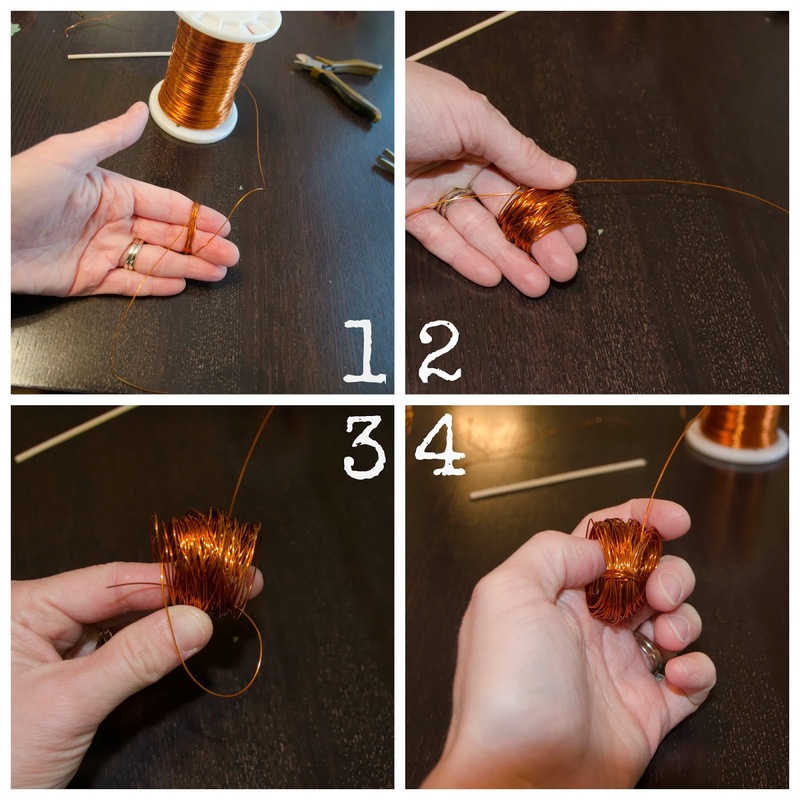 Leaving a tail of about 4 inches, wrap the wire around two fingers. I found that about 100 loops made a nice full pumpkin. The 24 gauge wire worked really well forming it by hand, but was sturdy enough to hold its shape. 2. Leaving another tail of about 6 inches at the end, cut the wire to disconnect from the spool. 3. Gather all the loops together. Take the 4" tail and thread it through all the loops. 4. 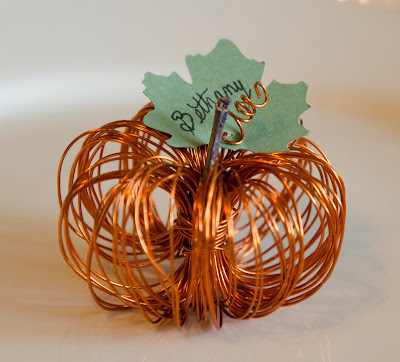 Wrap the 4" wire several times around the gathered wire center and hide the end in the wrapped wire. 5. Spread the loops evenly around the gathered center to form the pumpkin body. Use your fingers to round out the loops to get a nice shape. Leave the 6" tail sticking out the top of the pumpkin. 6. 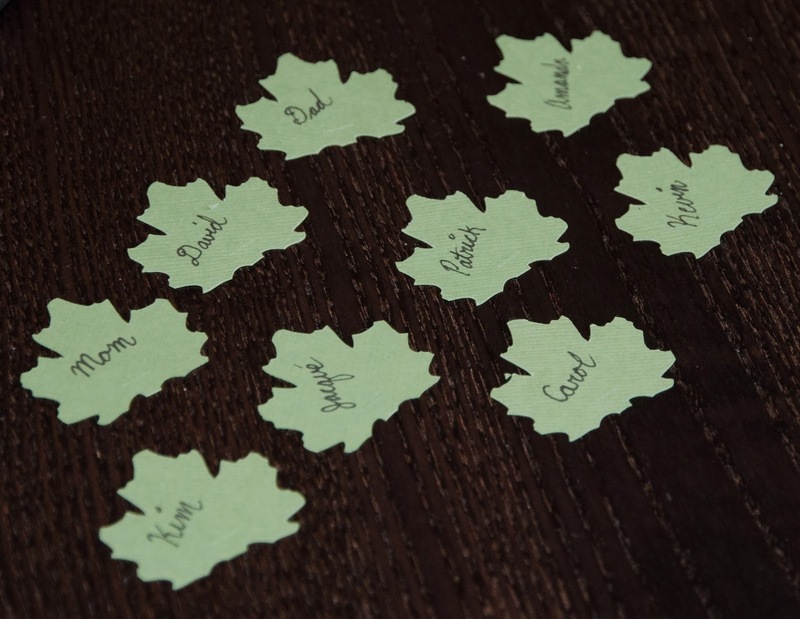 Cut your leaf from the green card stock and add the name. 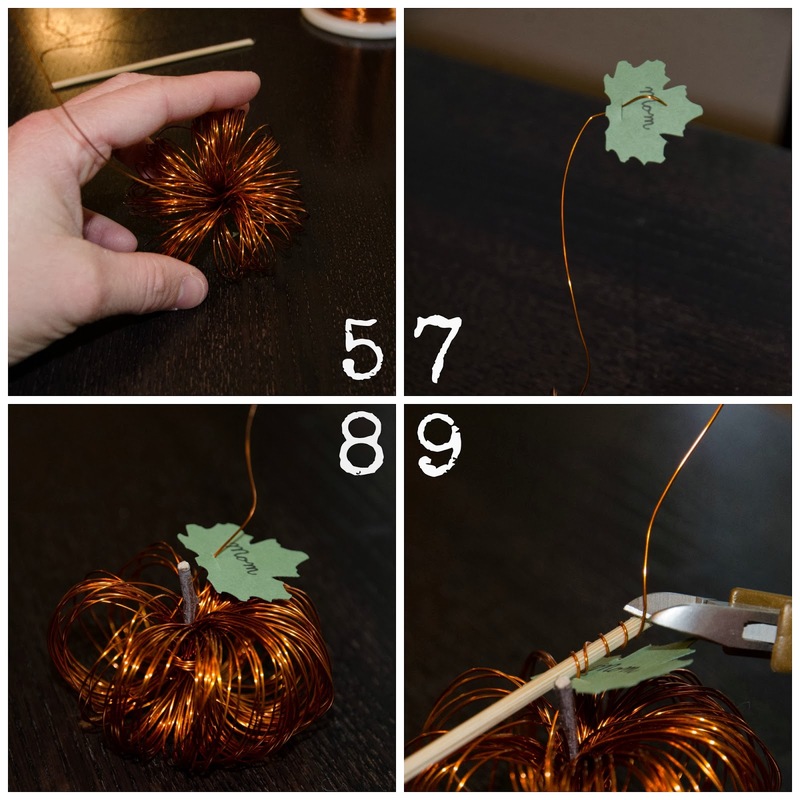 I used my Silhouette Cameo to cut the leaf and added a little slit in the top to thread the wire. If you add a slit by hand I would suggest an X-Acto knife. 7. Thread the 6" tail through the slit in the leaf. 8. Squeeze the small stick into the center of the pumpkin for the stalk. 9. Curl the remaining tail and cut off any excess. I curled the wire around a bamboo skewer from the kitchen and used the pliers to straighten out any kinks. And that is it! 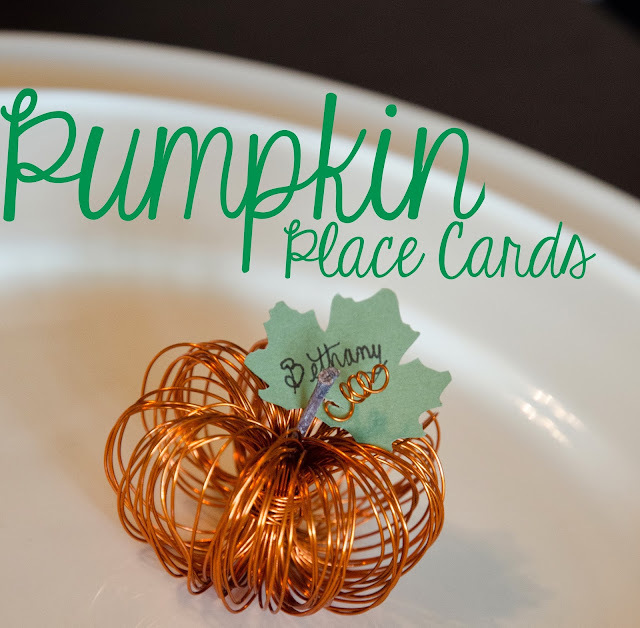 Teeny Tiny Pumpkin Place Cards that can double as decorations and party favors. 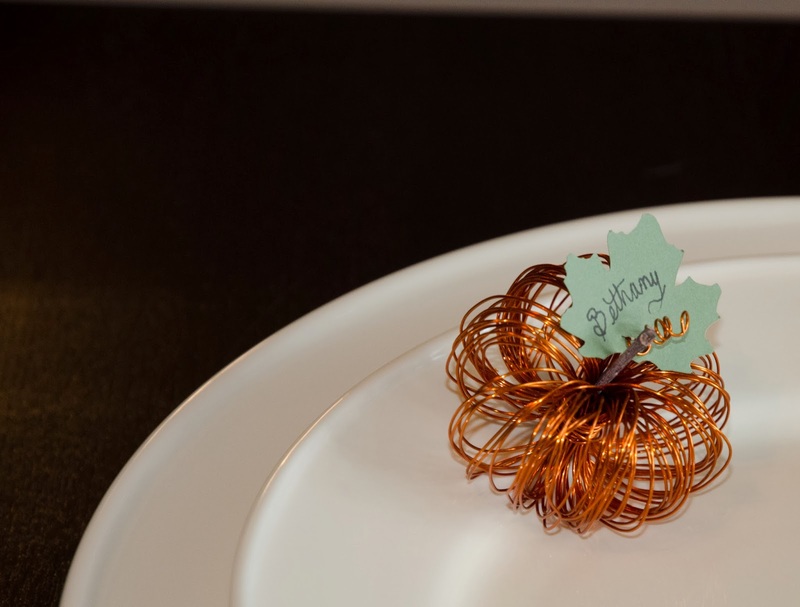 I made 10 of these little cuties for Thanksgiving. Until then, they will sit among my other pumpkins looking adorable and reminding me how excited I am to see my family :). Hi, I was wondering if I could order these place cards from you. Katie, oh I wish I could make them for you, but unfortunately I am already traveling for the holidays. Thanks for your interest in these place cards. They are favorites of mine:). If you have the materials they come together quickly if you want to give it a go yourself. Feel free to shoot any questions my way!